2017 Give STL Day - Join Us for the Celebration on May 11! What can you do in a day to improve your community? People striving for a sustainable lifestyle “live” that question every day. The answer: you can engage in composting food waste, recycling or repurposing items, planting gardens with native plants, conserving energy and water, using alternative transportation – so many things that help preserve our ecosystem so that plants and people can thrive. But, where can you find the support to meet your green living goals? That’s what we’re here for – we can help you! For EarthWays Center staff one day is filled with many ways we provide the St. Louis region with the tools they need to improve our local community through: educational programming in schools and universities, answering everyday green living questions from homeowners, assisting with near zero-waste events for Garden visitors , giving businesses seminars specific to workplace sustainability efforts, teaching building owners about energy efficiency and even rain water harvesting. As Missouri Botanical Garden's sustainability division, we want everyone to understand the links between their behavior and the health of our living Earth. May 11, 2017 is a special day for Missouri Botanical Garden’s EarthWays Center and over 800 local nonprofits in the region that help people reach their goals in making St. Louis and the world a better place. We are participating in Give STL Day and asking our supporters to donate during a 24 hour period. Why only one day? We are taking this day to join with others to highlight the work of many stellar nonprofits in the St. Louis region and to work together as a combined force for good in our community. You can visit the Garden's Give STL Day page for more details and to support us on the big day. 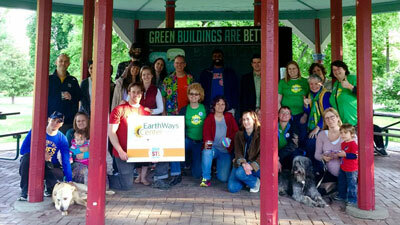 The first $2,500 in gifts to support EarthWays Center will be matched dollar-for-dollar. Give early and double your impact! And did we mention the party? EarthWays loves to party with old friends and meet new ones. We co-hosting a waste-free picnic with folks from Brightside St. Louis, Green Dining Alliance, The Nature Conservancy, St. Louis Earth Day, Tower Grove Park and U.S. Green Building Council to celebrate Give STL Day. Thursday, May 11 | 4–7 p.m.
Bring your own picnic, or buy the yummy food from Bombay Food Junkies food truck. We will have games like Giant Jenga and recycled crafts. Bring your family, your friends, even your dog—anyone you know who loves the environment and our community. EarthWays Center will recycle and compost all materials from the event. A party for the planet means avoiding sending items to the landfill! Here are tips to make your picnic waste-free. RSVP for the event online and get the latest updates via our Facebook invitation!